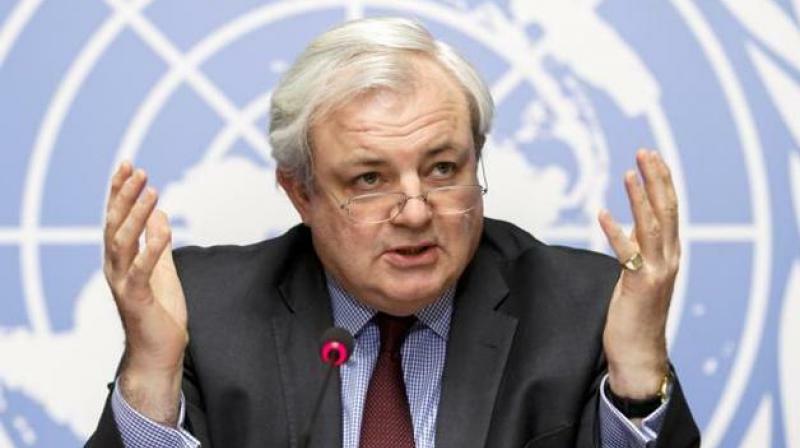 A few days ago, on 10 March, Stephen O’Brien, the United Nations Under-Secretary General for Humanitarian Affairs reported to the UN Security Council on the largest humanitarian crisis facing humanity since 1945. Many global challenges vie for our attention, but this one is of such enormity and urgency that it should surely be the headline on every news bulletin and at the top of every media agenda day after day. The question ‘what are we doing about it?’ should surely be the first thing we ask all our leaders at every opportunity…and keep asking until we are confident that everything is being done that can be done. He was referring to the fact that in Yemen, 18.8 million need assistance and more than 7 million are hungry and do not know where their next meal will come from. In Kenya, 2.7 million people are now food insecure, a number likely to reach 4 million by April. In South Sudan the man-made famine is worse than it has ever been; over 7.5 million people need assistance, 3.4 million people are displaced and more than 1 million children are estimated to be acutely malnourished across the country; including 270,000 children who face the imminent risk of death should they not be reached in time with assistance and the cholera outbreak that began in June 2016 has spread to more locations. In Somalia, 6.2 million people need humanitarian and protection assistance, including 2.9 million who are at risk of famine and require immediate assistance to save or sustain their lives, close to 1 million children under the age of 5 will be acutely malnourished this year. In the last two months alone, nearly 160,000 people have been displaced due to severe drought conditions, adding to the already 1.1 million people who live in appalling conditions around the country. In North-Eastern Nigeria and the Lake Chad region. 10.7 million people need humanitarian assistance and protection, including 7.1 million people who are severely food insecure. to tackle the precipitating factors of famine; preserving and restoring normal access to food and ensuring compliance with international humanitarian law. to provide sufficient and timely financial support, humanitarians can still help to prevent the worst-case scenario. To do this, we require safe, full and unimpeded access to people in need. Parties to the conflict must respect this fundamental tenet of international humanitarian law and those with influence over the parties must exert that influence now. to stop the fighting. To continue on the path of war and military conquest is to guarantee failure, humiliation and moral turpitude and the responsibility for the millions who face hunger and deprivation on an incalculable scale because of it. Whatever else we are, we are citizens of the world. Whatever we may disagree about, we can all see that these human conflicts threaten the survival of 20 million of our fellow human beings and jeopardise our collective security and our common humanity. Challenges on this scale cannot be addressed by a politics which looks only inwards and puts domestic interests first. To rise to such challenges we need a global politics and global leadership. The UN has set out the nature of this global crisis very clearly. We now need to respond as global citizens and demand the necessary global action. This entry was posted in Politics and tagged Anti-war, conflict, famine, global citizenship, humanitarian crisis, leadership, peace, Stephen O'Brien, UN, United Nations. Bookmark the permalink.